The Cisco Catalyst 9500 Series Switches are the industry’s first purpose-built fixed-configuration 25G, 40G, and 100G line of switches for enterprise-class core and aggregation layers. The Cisco Catalyst 9500 Series offers customers a wide variety of high-density, low-power switches and optics for both standalone and Cisco Software-Defined Access deployments. 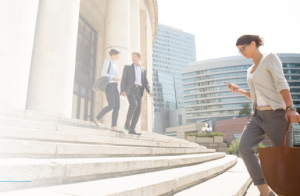 The Cisco Catalyst 9500 Series Switches are based on the Cisco Unified Access Data Plane (UADP) ASIC architecture, which not only protects your investment but also allows greater scale and higher throughput. The Cisco Catalyst 9500 Series delivers unmatched table scale (MAC, route, and Access Control List [ACL]) and buffering for enterprise applications. The Cisco Catalyst 9500 Series includes nonblocking 40G and 100G QSFP+ and QSFP28, and 1G, 10G, and 25G SFP, SFP+, and SFP28 switches with granular port densities that fit diverse campus needs. The Cisco Catalyst 9300 Series Switches support optional 4-port 25G network modules for uplink ports only. The default switch configuration does not include the network module. When you purchase the switch, you can choose from the available network modules. 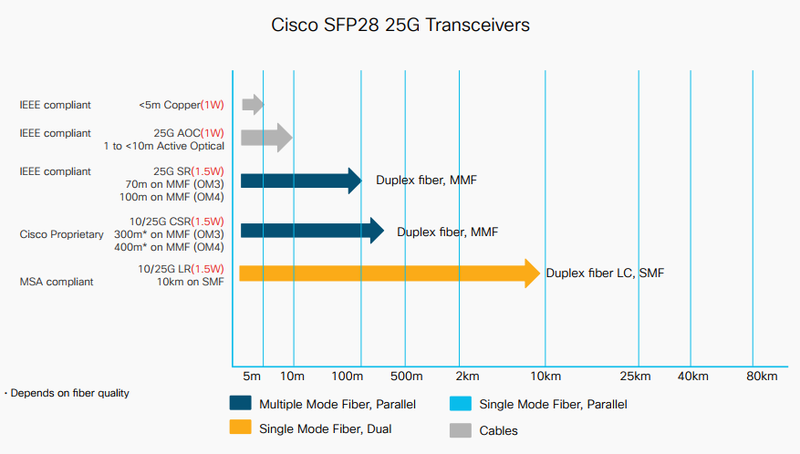 The Cisco 25GBASE SFP28 portfolio offers customers a wide variety of high-density and low-power 25G connectivity options for data center and high-performance computing network applications. Table 3 lists the cabling specifications for the Cisco 25G portfolio. **Up to 30 m/5 0m with no FEC, 70 m/100 m with FC-FEC. 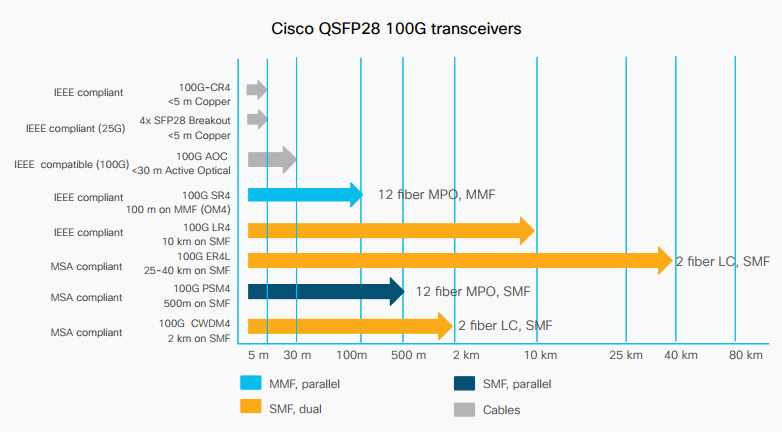 The Cisco 100GBASE QSFP portfolio offers customers a wide variety of high-density and low-power 100G connectivity options for enterprise core and distribution layers, data center, high-performance computing networks, and service provider applications. The QSFP-100G modules are our new generation of 100G transceiver modules based on a QSFP form factor. 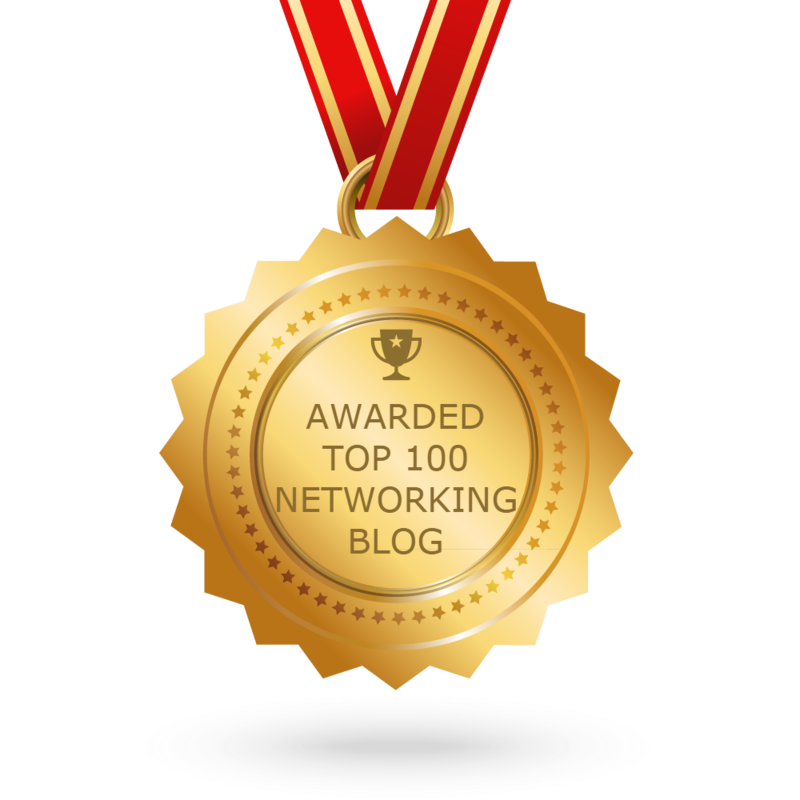 In a 3-tier campus, as the aggregation layer moves to 25G or 40G, it is desirable to have a 100G core. 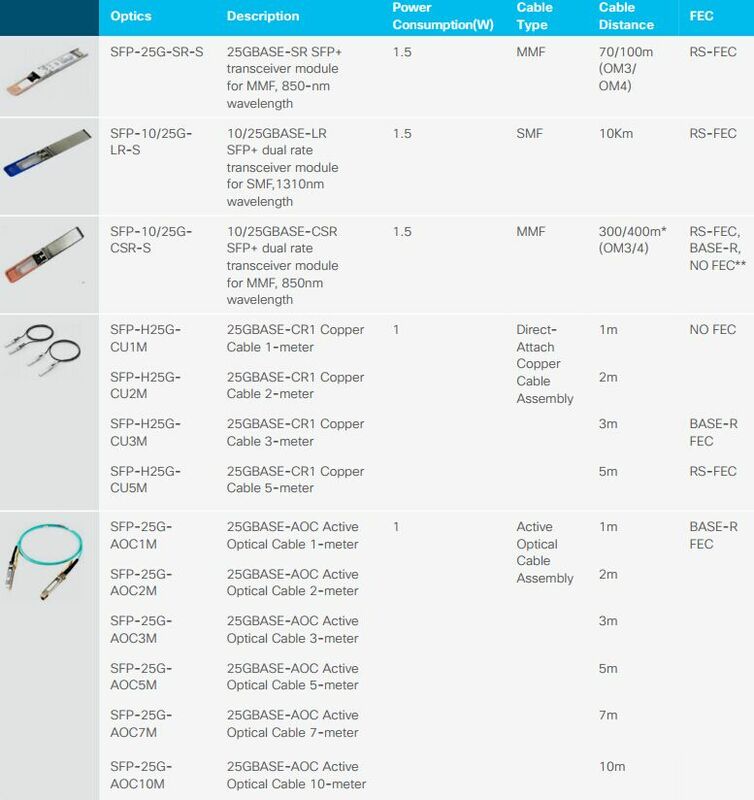 It is important to note that form factors of 40G and 100G optics are compatible. 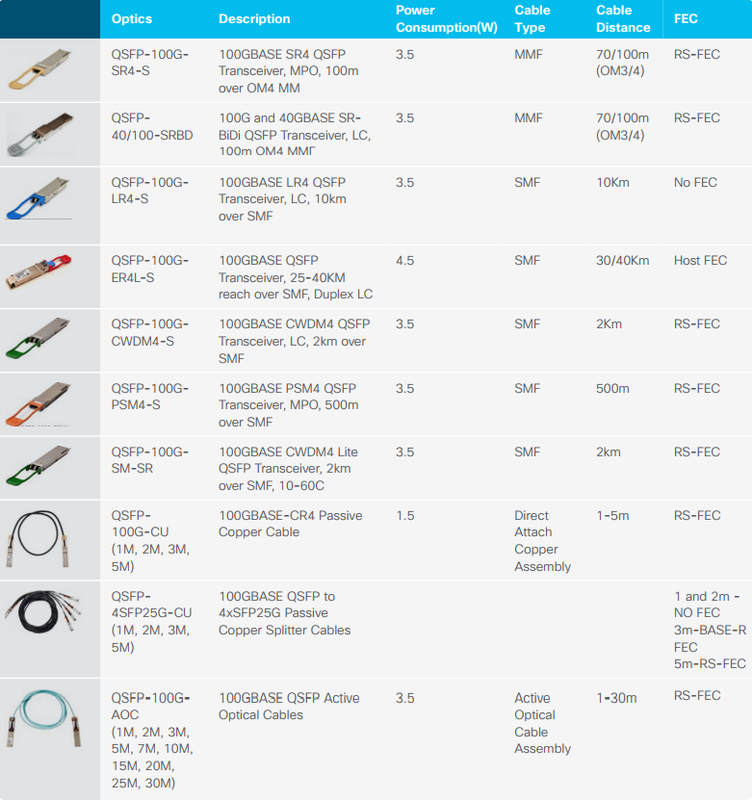 Table 4 lists the cabling specifications for the Cisco 25G portfolio.